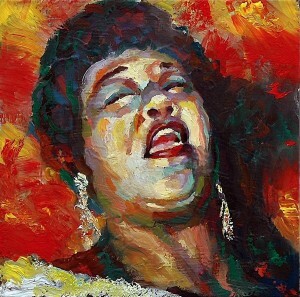 Red Ella Fitzgerald Small Framed oil on canvas impasto of Ella Fitzgerald. A bold representation of the legendary Jazz singer in her early years rendered in colourful swathes of oil paint. An original artwork represented in “That’s Jazz” exhibition Gardens Gallery, Cheltenham and The Cheltenham Jazz Festival, Town Hall.